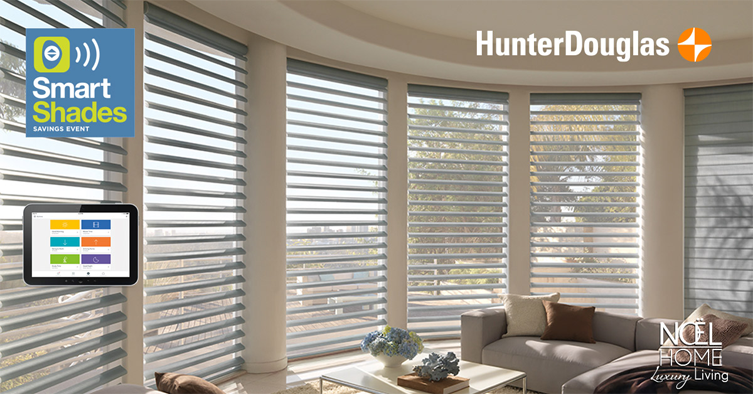 Hunter Douglas Shades with PowerView® Motorization. The intelligent shades that move automatically, according to a schedule you set. * Mail-in rebate savings available at Noël Home. Stop by for your free consultation with our design team or contact us below. * Manufacturer’s mail-in rebate offer valid for qualifying purchases made 7/1/17 – 9/11/17 from participating dealers in the U.S. only. For certain rebate-eligible products, the purchase of multiple units of such product is required to receive a rebate. Rebate will be issued in the form of a prepaid reward card and mailed within 6 weeks of rebate claim receipt. Funds do not expire. Subject to applicable law, a $2.00 monthly fee will be assessed against card balance 6 months after card issuance and each month thereafter. Additional limitations may apply. Ask participating dealer for details and rebate form. **The PowerView App and additional equipment required for programmed operation. ©2017 Hunter Douglas. All rights reserved. All trademarks used herein are the property of Hunter Douglas or their respective owners.